Beatty: This is the Get Sellers Calling You marketing podcast for real estate agents and I’m Beatty Carmichael. For simple to do proven marketing strategies focus exclusively on finding sellers and getting more listings, visit our website at GetSellersCallingYou.com. And now, let’s begin our next session of Get Sellers Calling You. Caroline: Hi everyone, this is Caroline Springer and welcome to the next session of Get Sellers Calling You with Beatty Carmichael. Beatty is the CEO of MasterGrabber, the creator of AgentDominator and one of the top marketing experts in the Real Estate field. Today, we’re going to be talking about the topic of geographic farming. We’ve been in a series and this is our fourth session within this series. Today, we’re going to be talking about expectations and how quickly you can earn money in geographic farming. Just a reminder for those of you that are on our live call, we will have the lines muted, but we will open for questions and answers at the end of the call. Welcome Beatty. I’m excited to continue on in our series. I think it’s been great so far and I’m excited to see where we’ll go. Beatty: Thank you. I’m excited as well. Geographic farming is so much fun because there’s so many things you can do. For those who know me, I’m really process driven and so geographic farming is all process driven. So this is fun. I’m excited to share about what’s going on with geographic farming with today’s call. Caroline: Yes, you are very process driven. Your processes are actually inspiring. I love how you always boil everything down to a science. You give formulas and if you’ll just follow these steps you will be successful. So I think that’s great and I love to hear you say geographic farming is fun because I don’t know for all of our realtors listening if it’s been fun for them. I think it will be good for them to hear that it can be fun. It can be a fun and successful thing that they can get excited about. Beatty: Well, always remember, if you’re making money with it, it’s fun. If you’re losing money with it, it’s never fun. So the whole idea is doing it right so you make money with it. That’s how you make it fun. Caroline: Absolutely. Well, we want to do a quick little refresher over the past three calls just to get everybody up to speed if they haven’t been able to listen and then we can just jump right in. Beatty: Yeah, let’s do. I think that’s a great idea. We probably have some folks that are on this call that may not have been on some of the other calls. If you’re listening in on a podcast version then you may have missed some of the other ones. Or, if you’ve listened to them, maybe it’s been a while. Let’s do a quick overview. Obviously, we’re talking about geographic farming and obviously geographic farming has very methodical processes that you do if you want to be successful with it. There are several steps. We are actually in our third step. The first step is choosing where do you farm because most agents just want to go “eenie meenie miney mo, pick a farm by its toe.” That doesn’t work real well. I shared this story the other day. One of our clients had picked up this area she wanted to farm and then I had a call with her and said, well, how did you pick it out? She said, well, I just live over here and I want to farm here. I said, do you want to make money or do you just want to farm there? She said, well, I want to make money. We walked through a process on how you pick out a farm. She spent a little bit of time and she came back the next day and said, okay, I’ve changed my mind. I want to farm this area and based on all the numbers, she’s going to make at least double the income in the new area than she would’ve on the first one. All that is by following the process on making it happen. That’s the first thing we talked about. Then, we talked about how you select a list. There are different ways to get a list and depending on what you’re trying to accomplish, the list makes a big impact. In fact, we go back for just a brief moment and talk at a purely thirty-thousand foot level in marketing. It’s not just geographic farming marketing but marketing as a whole. Any time you do marketing where you’re trying to generate a sale or generate seller leads, there’s three components that comprise everything. The list, the offer and the copy. In the list, who you target, where you’re targeting and all that is forty percent of all your results. So, if you get the list wrong, you just did everything wrong. So that’s where we spent a lot of time. Forty percent of your results outside of the list is the offer that you make. As it relates to a real estate agent, the offer that you make is why they should choose you over someone else. What are the reasons behind it? We’re actually going to get into that part in about two more calls. We’re probably very specifically going to go a call or two into what it is that you need to be doing in your marketing to get the sellers out. So, you have the list, you have the offer and then the copy. The copy is simply how you write that information. How do you actually put it in words? What do you do with it? That part is probably only about twenty percent. So that’s the overview of where we’ve come from. We’ve talked about how do you pick an area, how do you get the list and today we’re going to talk about what are the expectations in terms of how quickly you will earn money. Next week’s call we will then start talking about ten different things you can do that are low cost or no cost to really start to ramp this up and then we’ll move into the heart of the marketing aspect in the call afterwards. That will give you the big package of geographic farming. So, back to you. Caroline: Well, great. Thank you for that quick, little refresher, Beatty. Today, I know you’re very process driven and we’ve given everybody a great formula of the first steps between selecting your farm to how to create the right offer and how to select the right mailing list, so once you have all of that set up, the next step is now what? Now, what where does my effort come in to touch on these potential leads and how quickly can I turn around any of those things to make money. That’s what we have set up today is how quickly can you earn money in geographic farming and what is our part in playing with the expectation of what we can do to make that happen. I’ve heard you speak on this before and I think a really great call to action for all of our realtors to listen to. It’s more than just a postcard showing up in their mailbox. To see a great turn around and great results, there are expectations on our part in what we can do to make that money come in quickly. I know that’s what we’re jumping into today. Where ever you want to start with expectations or how quickly we can make that, let’s go. Beatty: Let’s talk about expectations and first off, why are they so important. I remember one of the great marketers out there, and he’s marketed a lot of products through infomercials and things of that sort. He’s known in the modern day in terms of those who are out there actively marketing right now as probably one of the best. His name is Joe Sugerman. He was telling a story about expectations and the cool thing about expectation are they really determine a lot in terms of the results you get. It’s really interesting because people will say, how can you expect to happen determine what’s going to happen? Well, because what you expect to happen means whether or not you stay in there long enough to make it or for it to have time to happen. Joe was talking about a product that he was, he had some physical ailment and I don’t know what it was, but he was talking to a friend of his who had this nutritional supplement. His friend said, “Ah, you ought to take my supplement because in about four months, you should see tremendous results and you should start getting rid of that.” So, Joe starts buying the product and guess what happens in four months. Any idea? Caroline: No, why don’t you, you always put me on the spot like that. Beatty: So, in four months, not much happened physically. Beatty: So what do you think Joe did? Did he stay on the product or did he quit? Beatty: And why do you think he quit? He did, but why do you think he did? Caroline: I guess he didn’t think it was working and he thought maybe there was a better route to take. Beatty: That’s right. He didn’t think it was working because his friend had set the expectation that in about four months he should see results. Because he didn’t see results in those four months, he said, it must not be working just like you concluded. However, if his friend had said, it will take a while, so give it at least a year or longer and in that timeframe you should see results. Do you think he would’ve been more likely to see results after taking it for a year instead of four months? Caroline: Absolutely. I think, from my experience and understanding with geographic farming, I think a year is a great timeline to give yourself. Beatty: Okay, but we’re still talking about the nutritional supplement. So, the point is this. Caroline: Sorry. My brain’s connecting to geographic farming. Beatty: Yeah, you’re connecting the dots a little too quickly, but you’re moving the right direction. The point is this, the expectations will help determine your results because they will determine if you stay in the game long enough to get those results. What happens is as it relates to expectations for geographic farming, most agents have wrong expectations and because they have wrong expectations, they don’t get the results they want. Either they don’t do the level of activity, they don’t do the quality of activity, or they don’t do the longevity of activity because their expectations are wrong. So the most important thing, once you find out where you’re going to be farming, is to figure out what is it really going to take and be willing to sit in the seat long enough to make it happen. I’ve got one last analogy on this because it’s really kind of fun. To take a ten hour car trip with kids and in your mind is that a short trip or a long trip? Caroline: A long trip. We just went to the beach with our son and it was four hours and it was a long trip. So ten hours, I can’t imagine. Beatty: Okay, so, we put all of kids In the car and this was years ago when they were young elementary school and probably kindergarten, and we hop on a trip and it was ten hours to get to St. Louis, Missouri and you start to see the arch. You know our comment? Wow, this is really fast. I didn’t realize it was this close. Why do you think we thought it was a very fast trip and it was really that close and after ten hours in the car? Caroline: Maybe, like you said, your expectation, your thought of how long the trip would take was going to be even longer. But when you got there in only ten hours, you’re not really thinking about ten hours, you’re thinking that wow, that was quicker than I realized. Caroline: I think it’s just that expectation like you said. Beatty: Because we were actually headed to Colorado which is thirty-six hours. Our horizon was so far out in the future that by the time we hit St. Louis, it was such a small part of the trip and we didn’t realize it was that close. But, however, if we’d set out to go to Memphis, which is four hours from here, and then we had to go on to St. Louis, that ten hours would’ve been a huge time commitment. So, you’re perspective on your expectations is what’s going to drive what you end up doing and how you do it that gives you there results. So, as we talk about expectations here, the expectations when you do geographic farming is you are not going to make money immediately. Now let me add a little caveat. We do have a way with our geographic clients that we’ve had a number of them make as much as $100,000 in the first year. But that is doing it completely out-of-the-box thinking. So let’s talk about what typically you expect and then we will talk about some things that you can do that modify those expectations. Generally speaking, when you talk to realtors who do geographic farming, here is the general consensus. It’s going to take somewhere between the first and second year or maybe into the third year before you get your first listing. Typically, you will do it for a year of two years before you get your first listing. Then you’ll continue to do it at that same level of activity for about three and five years before you get real consistent listings all of the time. That is the expectations of what should and most likely will occur when you do it the normal way. There is a coach out there named Tom Ferry and he has a quote. Someone was asking him about postcard marketing (because typically you do postcard marketing with geographic farming) and his comment about that was, “If you are going to do postcard marketing, you have to do nonstop marketing for at least three years before you can expect those homeowners to even remember your name enough that they will pick up the phone and call you. So that is the expectation. Geographic Farming, as we talked about earlier, is a long-term investment in your brand. It’s a long-term investment because it takes a while to get there. Are you following me so far? Caroline: Absolutely. I can attest to that. All the testimonies that I’ve seen and heard are kind of right along with that, if you can’t stick it out for at least one full year, you aren’t going to see results, especially the big, turnaround results that we know are possible. You’ve got to be able to stick it out at least one year, and like you said, up to five years and even beyond that to see a really big turnaround. Beatty: Yes, so that’s going to be taking it the standard approach in geographic farming. Now I’m going to talk in just a moment on some things at a high level that you can do to dramatically improve those numbers. Next week, we are going to start talking about some of the specific things that we will kind of allude to on today’s call and we will kind of dig deeper into it. But that is the expectation you need to come in with. It is going to take two to three years before you really get results. You can fast track those results by doing better touches and more touches. So those initial expectations is the general population, people doing the normal touches that they normally do. If you look at marketing, and especially in regard to geographic farming, your marketing is a layered effect. Every touch that you do adds another layer in that prospect’s mind. So does it make sense, Caroline, that if I am going to mail 1 postcard every two months, which is six a year, that in three years, I’m going to have 18 touches. Does it make sense that if I were to mail all 18 postcards in the first year, then I’m probably going to get to the same level of production 3X faster by doing 3X as many mailings. Are you following the logic? Caroline: I am. I would think so because I think so because I think with postcard marketing, the whole goal is to keep you top of mind and in front of them so you are the realtor that they think of. It would depend on the turnover rate of the homes that were selling in that neighborhood. I would think that increasing that mailing in that time period you would definitely increase the chances of finding more prospects that way. Beatty: One simple concept that we can pull out of this is the more touches you do in the shorter amount of time, the more results you’ll get within that same timeframe because it’s all about how many times are you touching them. This is why the expectation is normally two to three years to get any real traction because most realtors only touch them twelve times a year, once a month. Sometimes they may only touch them four times a year or once a quarter. But if you will increase the frequency of your touches, so you get more touches within the same time frame, then you’re going to increase the speed in which you start to get results. So that’s one thing you can do in terms of improving your expectations. Now, with increased touches comes increased costs. If I’m spending $1,000 a year mailing twelve times a year, then in three years, that’s $3,000. If I were to mail all thirty-six of those in one year, I’m going to spend the same amount of money, but I’m going to spend it in one year. Your touches are going to increase your costs. It just means that you will get more results faster. There’s one other element, though, that comes with increased touches. It’s not as simple as a straight-line addition. If I’m touching someone every two months, that’s six times a year, in three years that’s eighteen times, I will get farther down the road in shifting those homeowners’ mindset if I can touch them eighteen times in one year versus eighteen times over three years. In other words, the concentration of your touches will increase the efficiency of those touches as well. Are you following me on that? Does that make sense? Caroline: That absolutely makes sense. Beatty: We want to, as much as possible, concentrate the number of touches into a shorter time frame because you’ll get more punch out of each one and that’s going to move you along. The second thing you can do is you can increase the quality of your touch. Let me give you just a high level example. You could send out a postcard if we just keep it as a postcard concept right now. You can send out a postcard and say, “Hi. I’m a real estate agent in your area. Call me if you want to sell your home.” Or, you can send out a postcard that says, “Just sold this home in your area.” Which of those two touches do you think would be more responsive in getting any sort of a mind shift in your prospects? Caroline: Well, obviously, the second one. One, it’s proof of a sale, but then it’s also proof of a sale in my area so they could be more familiar with my neighborhood and my house, so that would definitely garner a higher response. Beatty: What we now get out of that is all touches are not equal. By changing what you do with the touch, even it’s a postcard by changing the content, you can improve the effectiveness of your touch by improving the quality of the content that you’re putting out. So, changing your frequency, changing the quality of the content is going to then concentrate the amount of results you get more quickly. This is why when we’ve done a lot of work with our clients, and I will give you one example, I may have mentioned this last week, I don’t recall. One of our clients wanted to start targeting a golf community. The number one agent in that community had ten percent of the sales, this is like an 1100 home golf community. The number two agent had seven or eight percent and my client had never marketed there before. We started to do a number of different things and in the first year, he was the number one selling agent. In fact, in his first seven months, he had fourteen listing appointments. It was dramatic and you can do that if you get your process right. That’s where we’re headed. So the expectation is be there for a long time. If you’re willing to modify what most agents do, then you can get results a lot quicker. Now, let’s talk about quantity of touches and what’s really being expected. If you talk to the agents and you read the interviews or listen to the interviews that are all over the place, because a lot of agents have been interviewed about geographic farming, what you’ll find is the follow metrics. A minimum of twelve postcards a year. That’s the absolute minimum. Everyone who is successful in geographic farming, they say that’s the absolute minimum. Don’t even attempt geographic farming if you’re going to do less than twelve postcards a year. The average that they that you should be doing is eighteen a year, which is once every three weeks and the maximum that most of them will say is probably twenty-four a year. Once a month, every three weeks versus twice a month. I think the best number is going to be about eighteen times. Another thing that was real interesting, a couple of agents that were interviewed on this made this comment, and it makes sense. That is, if you have a selling season, like in most places selling season starts to ramp up in Spring and Summer and then it cools down at the end of Fall and Winter. What they recommend doing is doing twenty-four mailings a year, but it’s not equally spaced. Out of those twenty-four mailings, they will ramp it up about two months before the selling season starts so that they can start to prime the pump and they keep it running full speed all the way through the selling season and then once that they are out of the selling season, they pull it back to maybe once a month. They will increase frequency in that period of time that there’s more activity and then they pull it back but not so far back that they’re non-existent. Does that make sense what I’m saying? Beatty: That is the frequency of postcards. So then postcards are not the only thing you do. They’re a significant part. You want to be looking at, at least, probably twenty additional touches in some capacity every year. You’ve got twelve plus twenty, that’s thirty-two total touches on the low end or twelve plus twenty-four, that’s forty-four total touches on the higher end. It’s these other touches that you do that we’re going to talk about more in depth next week on this. Of those touches, the things that stand out the most as I talk about it real briefly, is door knocking and social media. A lot of other things, but door knocking and social media tend to be the strongest things out there. I remember one of our clients we were mailing only eight times a year, or maybe it was twelve times a year. I can’t remember, but it was really early on before we learned a lot about geographic farming. We had a client that was targeting a 1500 home community. Had like an eight percent turnover rate, so like 120 to 140 type of homes every year were selling. He was a nobody there. We started targeting it and he door knocked and got involved with the Facebook community page. So, three things, postcard mailing, door knocking, Facebook community page. In the first year, he earned about $100,000 directly related to us, but you can’t say it was directly related to us as much as it was influenced by his door knocking and other stuff because it increased the responses from the postcards. He made another $50,000 from what he could measure directly from his Facebook community page activity because he was constantly posting. Here’s the point I wanted to share, in eighteen months from going from a nobody in terms of a listing agent, within eighteen months, he was controlling twenty-two percent of all of the listings going on in that 1500 home farm. Within another year or year and a half, he was at fifty percent. At twenty-two percent, he was outselling the number two agent by seven times. This is the impact when you start to add multiple touches all focused on the common thing and staying in front of and top of mind of all the folks in that farm. It’s just amazing the type of lift that you do. In the last moment that we have, I want to underscore one thing on this. It would not have happened without door knocking in my personal opinion. Studies have shown that once someone has met you, then they are seven or eight or ten times more likely to do business with you than someone who has not met you. The fact that he went out and actually door knocked that community three times a year and he met a lot of the folks, it created an immense amount of trust that then paid huge dividends. He was willing to invest time and money into that farm and it’s made a small fortune for him on an ongoing basis. That’s where you want to be focused on with expectations. If you do it that way, you’ll make money the first year. If you do it the normal way most agents do it, then you to wait a year or two to get your first listing and that won’t quite pay for your entire investment in that farm by that time, but at least it gets you going and three to five years down the road, you’ll actually start making some good money. It’s just a matter of how you want to structure yourself and that determines how quickly you’ll make money. So, back to you. Caroline: Wow, well, thank you, Beatty, for walking us through that. I’m excited to hear next week continuing your great ideas and then you’ve got some low cost ways to do those additional touches. I think that really is where we see it’s a game changer and making it profitable. For those of you listening, tune in next week while we continue on this conversation. I think we are just about out of time and need to wrap up. Beatty, thank you so much for your time and expertise today. I think it was a great call and great continuation of our series. Before we close out the call, do you have anything else that you’d like to share, Beatty. Beatty: I would. As always, I like to put a little unabashed plug for what we do. We’ve learned a lot in working with our clients. 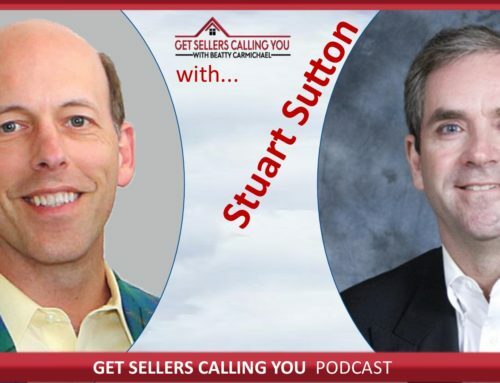 You can get everything we know for free at Get Sellers Calling You and these calls, but knowing versus executing expertly are two different things. If you want help in doing this, if you want to outsource geographic farming or even following up with your own personal list, then check out the service we offer for pay. We call it AgentDominator.net and you can learn more about that. Fill out a form and we’ll contact you and set up a demo. So, if you love the learning, but want someone else to do it, that’s where AgentDominator.net will come in. Caroline: Great. Well, perfect. So, thank you, Beatty. We’re going to wrap up the call and for those of you that are live with us, if you have questions that you’d like to ask Beatty, just hold on and as soon as we’re wrapped up we’ll go into a short question and answer time. That’s all we have for today’s call. Thanks again, and thank you, Beatty for sharing. Beatty: Well, thank you. I’ve enjoyed it.